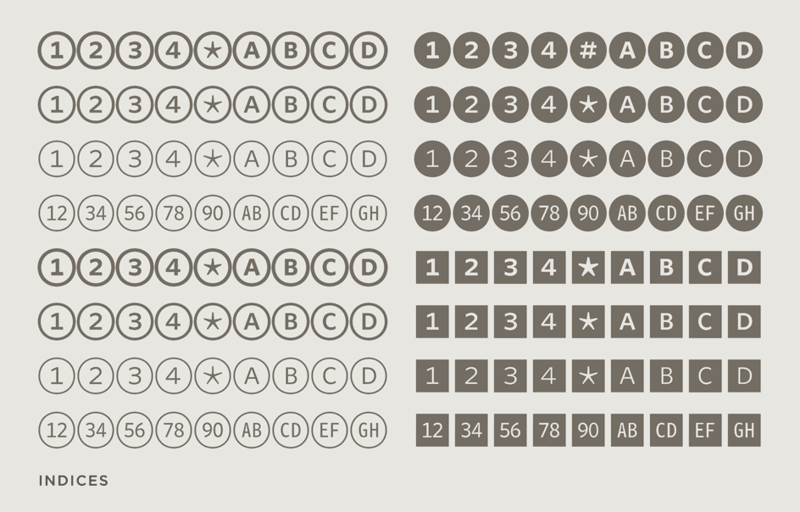 Whitney Font Features: Indices | Hoefler & Co. Whether it’s enumerating the steps in a recipe, labelling a diagram, or marking key places on a map, a set of circled numbers — known as indices — comes in handy. Whitney provides them pre-assembled in sixteen different styles. “Numbers in circles” seem so straightforward, until you try to make them yourself. (Especially if you’re on deadline.) Since designers have better things to do than wrestle with a zero that’s both wider and taller than a one, we’ve created a collection of fonts called Whitney Index, which provides these characters pre-made in sixteen different configurations. Whitney’s indices come in three different weights, enclosed by both circles and squares, and each provided in positive and negative versions. Double digits are included, for when recipes run to step 11 (or 99), along with a full alphabet, for that unexpected gate 6C at the airport.